To complete the sentence: Kurbaan is an honest effort at trying to please different sections of the audience — be it the average moviegoer who seeks entertainment every Friday, or the serious cinema buff searching for a new experience in every flick. And it is precisely in this “honest” effort to cater to two different strata of audiences that the movie’s focus shifts between triteness and realism; between saleability and creativity. In essence, Kurbaan is a tale of love torn-apart in times of terrorism. The love (or love-making) story contributes to the entertainment part and the issue of terrorism providing for the realism part. As a consequence the end-product — the movie — is unsatisfactorily dichotomized into being saleable and artistic. By all means, and rightly so, commercial cinema (apologies for labelling cinema) necessitates balancing the two extremities of saleability and creativity with ingredients such as romance, melodrama, humour and other stereotypes. However, if not perfectly performed, this balancing act can leave gaping loopholes in the screenplay, thus compromising with the intended premise of the story. To elucidate, Kurbaan starts with the romance of professor Ehsaan, a Muslim, and professor Avantika, a Hindu, who share a sizzling chemistry and passionate moments in the university staff room. Despite the religious differences, Avantika (Kareena Kapoor) and Ehsaan (Saif Ali Khan) tie the knot and fly away to New York and start living in an Indian neighbourhood. Strange things start happening from day one and soon Avantika realises that her husband is a terrorist and she can trust no one. Avantika takes the help of Riyaaz (Vivek Oberoi), a journalist, who infiltrates Ehsaan’s gang to settle a personal score. Pretending to be a treatise on terrorism, Kurbaan is in fact an edge-of-the-seat thriller languidly instilling a sense of excitement and fear at every step. Minus the pseudo-intellectual talk by its characters, Kurbaan is guaranteed to surprise, occasionally giving one the creeps, when one least expects it. Despite glaring loopholes, too many to discuss here, powerful performances by Saif, Om Puri and Kiron Kher hold the plot together. Kurbaan has its gory moments too and, like the movie’s tag line, has blood and violence writ all over it. The suspenseful and interesting screenplay keeps one captivated throughout the movie’s first half. While Ehsaan’s better half sheds her bit (oops! I mean, does her bit) with some steamy scenes to unsuccessfully retain the audience’s and her husband’s interest in the second half. What happens next is no different from its predecessors à la Fanaa or New York — a love story metamorphoses in to a larger plot on terrorism; but in the end love has its way. 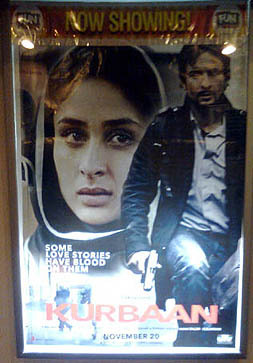 To reiterate, lacking a singular focus, Kurbaan mixes up one issue too many — love, terrorism, suspense, et cetera. And although it boldly attempts to rake up the issue of terrorism in a post 9/11 era, it barely manages to scratch the surface. It is often commented that one state’s ‘terrorist’ is another state’s ‘freedom fighter’. Sadly, Kurbaan fails to explore such larger issues and continues in typical Bollywood fashion to entertain rather than educate. p.s: For some serious cinema on terrorism, revisit Khuda Kay Liye, Govind Nihalani’s cult classic Droh Kaal or Kamal Hassan’s Kuruthipunal (Tamil). Tags: Kareena Kapoor, Kurbaan, Kurbaan review, Saif Ali Khan, Terrorism. Bookmark the permalink.